Plant Kingdom, from their nursery in Flat Rock, brothers Matt (left) and Tim Nichols run one of the largest Japanese maple tree operations in the country, propagating and shipping more than 1,000 cultivars. Secret Garden While the Nichols’ nursery is open by appointment, Hill Stone Arboretum (opposite), a display garden owned by their retired uncle, is open only on Memorial Day. Mr. Maple nursery is located in East Flat Rock. From their nursery in Flat Rock, brothers Matt (left) and Tim Nichols run one of the largest Japanese maple tree operations in the country, propagating and shipping more than 1,000 cultivars. It’s a nippy spring morning, and brothers Tim and Matt Nichols—the brains and most of the brawn behind a world-renowned Japanese maple breeding operation in East Flat Rock—are escorting a visitor around their sprawling nursery compound. In the stylized world of Japanese maples, the brothers like adding what they call a little “redneck ambiance” to their business, Mr. Maple. Located at the end of a quiet country road, close to the General Electric factory where their dad worked for 40 years, the nursery hosts a Memorial Day open house and sale each year. Hot dogs and banana pudding top the refreshment list. That event is “intense,” the brothers joke, as Japanese maple enthusiasts from all over the United States descend on the 10-year-old nursery, seeking to enhance their own collections of the captivating little maples. Acer palmatum: The Japanese maple is a botanical superstar treasured for its elegant shapes and intricate bark and leaf variations. 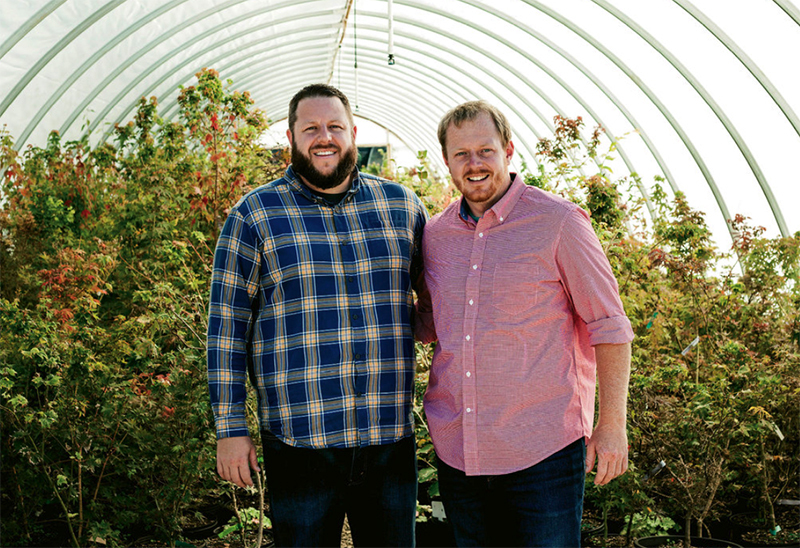 Tim, sandy-haired and 30, and Matt, bearded and 36, aren’t just in love with Japanese maples—they think and talk about them constantly, and endlessly experiment as they propagate more than 1,000 existing cultivars and invent unique ones of their own in 15 greenhouses. Look for the recently launched Gold Digger Japanese maple, distinguished by peachy-pink highlights and lustrous gold bark in the fall. 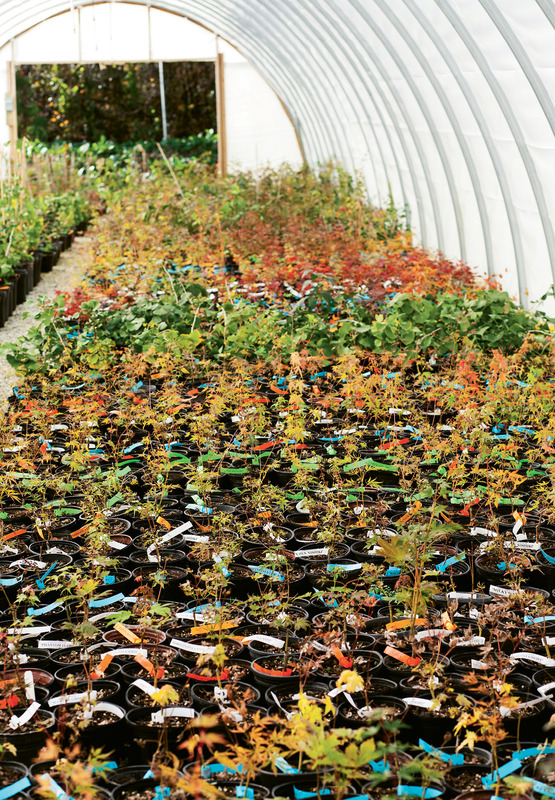 Besides propagating thousands of individual Japanese maples for sale, the Nichols brothers grow nearly 500 other kinds of woody ornamental shrubs, including 150 varieties of ginkgo trees and 25 different dawn redwoods. The two men finish each other’s sentences, creating a sibling surround-sound effect. “It’s such a blessing to be working with my brother,” says Tim. “He’s my best friend.” Living in close proximity to their parents and a beloved aunt and uncle, Matt and Tim call their nursery business “a big family affair.” After all, practically the whole family has nurtured their talents and dreams, and everyone’s yard is fair game for landscaping and tours. Henderson County’s climate—warm days and cool nights, plus adequate rainfall and lots of sloping land for drainage—is ideal for growing Japanese maples. Boulders and rock walls provide backdrops for the trees’ interesting shapes, colors, and sizes, while creeks and ponds showcase their value in the landscape. Sunlight filtering through lacy Japanese maple leaves of brilliant red or chartreuse green can leave an indelible impression, and a specimen maple underplanted with a contrasting ground cover makes a bold statement too. The brothers inherited their father’s skill for growing and propagating Japanese maples and other shrubs; for Norman Nichols, the plants were a passion but still just a hobby. From their maternal grandmother, also an amateur plant propagator, they got their light touch with raising plants from her heirloom collection. A garden legacy like that is hard to shake. Both Matt and Tim graduated from East Henderson High School, and they are also both graduates of Western Carolina University, although Tim started out at UNC Chapel Hill, bringing home plant propagation books from the library on weekends to study with Matt. Matt’s degree in history and political science was a good fit with plant science, it turns out. “Every maple has a story,” he says. “Those stories are important for us.” For Tim, who worked for a time in banking, a business degree has been a boon for managing and expanding the nursery. “A lot of nurseries fail not because of bad growing practices but from bad business practices,” he notes. The two also joined The Maple Society and the International Plant Propagators’ Society and quickly became luminaries for their energy, drive, and comparative youth. Today, with just two other workers, they are international Japanese maple stars, shipping as many as 100 boxes a week across the country. While mostly self-taught in plant propagation, they now guest lecture 30 to 40 times a year at colleges and arboretums across the country. 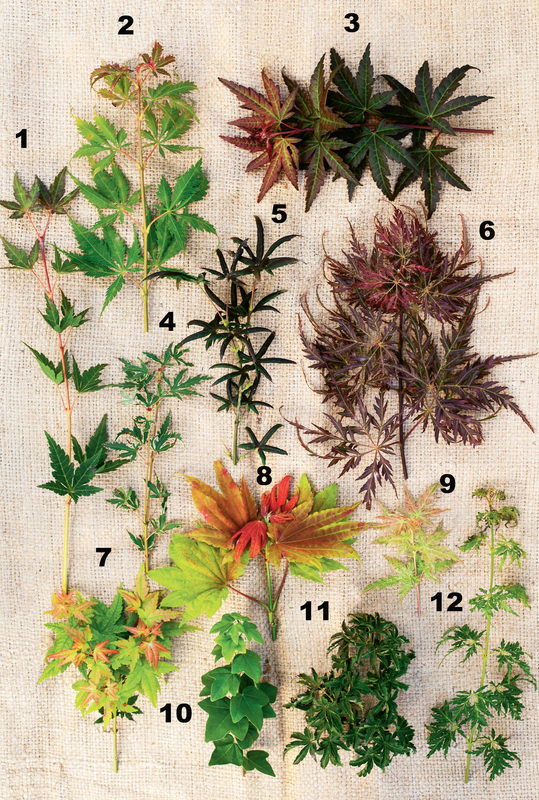 To create new and ever more fanciful cultivars of Japanese maple, as well as the other ornamental plants they offer, the Nicholses use a technique called grafting to marry distinctive characteristics that can stay true for many plant generations. These grafted maples are healthier than standard plants, they say, and can live for hundreds of years, although the size remains compact. It takes about eight years to come up with a completely new tree, and the process involves a lot of field-testing in different regions—the brothers ship samples to friends to grow and report back. “We want it rock solid for our customers, so plants are easy to grow,” Tim says. See www.mrmaple.com or email info @mrmaple.com for details. Visits are by appointment. With more than a thousand different cultivars in existence, the variety of Japanese maples is staggering. “There’s a maple for every spot in the garden,” says Tim Nichols. Tough Japanese maples thrive in Plant Hardiness Zones 3-10, depending on the cultivar (most of WNC is zoned 6-7). They can grow well in pots and are effective in rock gardens and near walls and ponds. The Nichols brothers advise: Look for a pleasing shape. Japanese maples can grow in weeping, upright, dwarf, and even creeping forms. They can range in height from two to 30 feet. Use the trees to accent your landscape, not necessarily in mass plantings. Bark and leaf colors change dramatically throughout the seasons, ranging from bright greens and yellows to subtle pinks, deep orange, and crimson, depending on the variety. Think drainage! Japanese maples have wide, shallow root systems. Plant them where they can drain readily and not be waterlogged. When planting, set the trees at or slightly above ground level for best drainage, and avoid piling mulch around the trunk. Let the trees dry out between waterings but check frequently. Fertilize sparingly, in March. Japanese maples need little pruning. Use the dominant branch structure as a guide, and prune only in mid- to late-March, removing crossed branches and damaged limbs, nothing else. Gardeners should merely highlight each tree’s best natural features. Never try to prune a weeping form into an upright, or vice versa. A green maple with fiery red fall color. Reaches 15 ft. tall by 6 ft. wide in 10 years. Among the best for fall color, infused with shades of orange, red, and magenta. 10 ft. x 10 ft.
Orange-red in spring, turning deep burgundy in summer and orange in the fall. 8 ft. x 6 ft.
A new miniature maple with pink margined variegation and red fall color. 5 ft. x 5 ft.
A dwarf Japanese maple whose red leaves curl downward starfish-like. 8 ft. x 6 ft.
A dwarf weeping laceleaf maple. Burgundy red in summer, turning brighter red in the fall. 4 ft. x 5 ft.
A compact dwarf maple with small leaves that turn red in the fall. Excellent for small spaces. 4 ft. x 4 ft.
Salmon pink new growth over large lime green leaves. Yellow to orange fall color. 10 ft. x 8 ft. Pink leaves in spring that turn to green then orange by fall. Yellow to orange bark adds winter interest. 12 ft. x 8 ft.
A dwarf trident (or three-toothed) maple with tight, compact form and rounded bubbly-looking leaves. Red fall color. 6 ft. x 4 ft. Known as the “Lion’s Head” maple, with tight, curly, deep green leaves. The texture and yellow-to-orange fall color appear like a lion’s mane. 6 ft. x 5 ft. The fastest-growing maple, and one of the only upright laceleaf varieties. Green dissected leaves turn bright crimson to deep maroon in fall. 15 ft. x 10 ft.